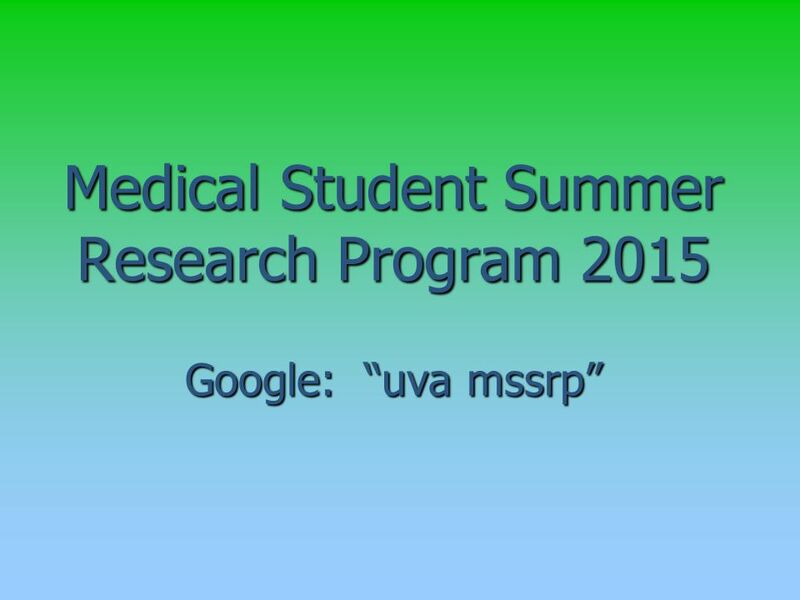 Download ppt "Medical Student Summer Research Program 2015 Google: “uva mssrp”"
Sunmontueswedthursfrisat SUMMER 2014 R#1 DUE SUMMER 2014 R#2 - FINAL REVIEW SENT FALL. 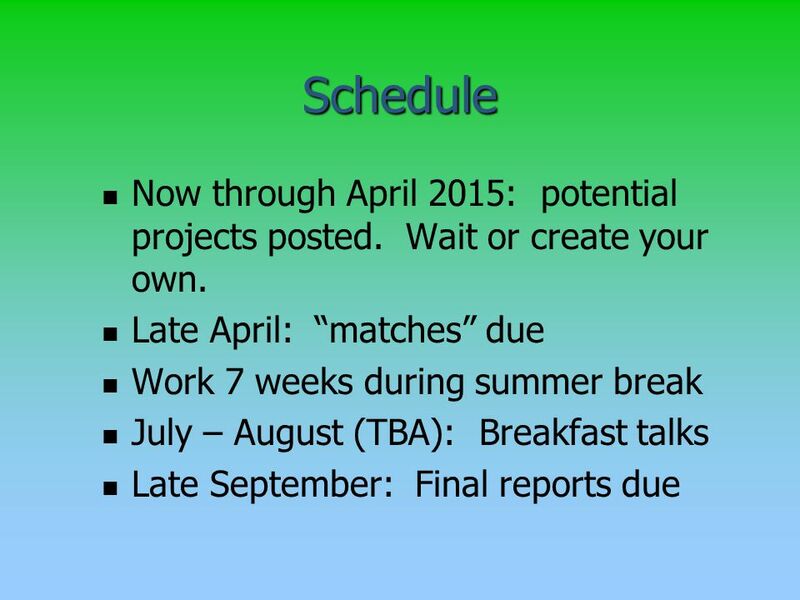 End of Fall Term Checkup SYSC-4907  Group Procedures  Progress Report  Oral Presentations  Poster Fair. CSE 115 Week 14 April , Announcements April 14 – Exam 10 April 14 – Exam 10 April 18 – Last day to turn in Lab 8 for any credit April 18. Navigating SPED After BCLAD Emily Villagrana Bilingual Special Education Teachers Network August 2011. 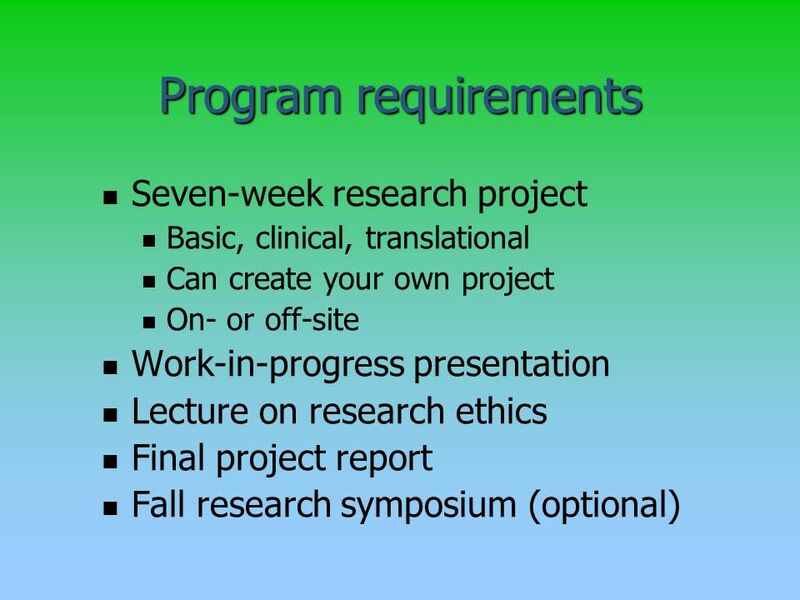 CIS 310 Management Information Systems Course Overview Guthrie, Summer 2014. © Neeraj Suri EU-NSF ICT March 2006 Dependable Embedded Systems & SW Group Introduction to Computer Science 2 SS 2006. Automating the Corrective Action Plan Allison Miles State of Pennsylvania. Welcome to Junior Parent Night—Part 2. “What should we be doing?” A timeline for success through the college process. Darlene Martin, MS, RD, Asst. Director Long Beach Unified School District Nutrition Services Branch CITIES, SCHOOLS & COMMUNITY PARTNERS: WORKING TOGETHER. 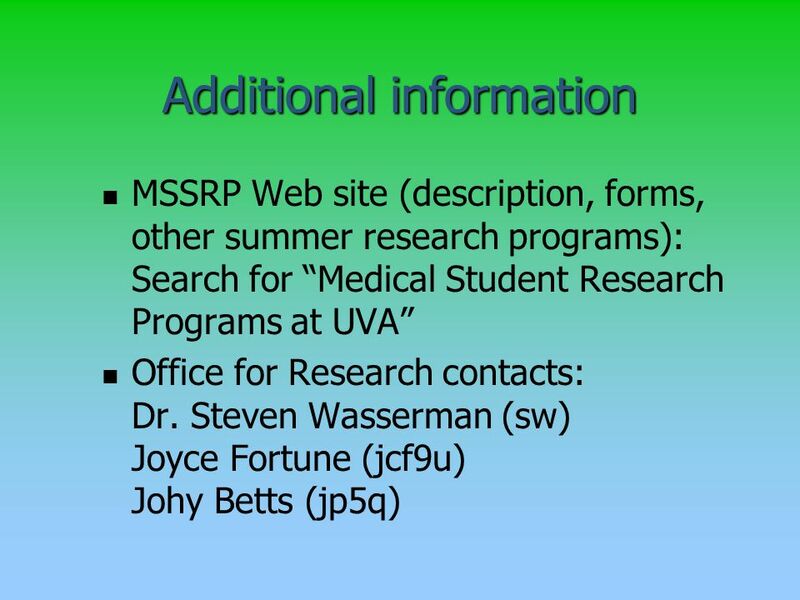 RESIDENCY 101 ERAS Overview 2014 Jimmy Renfro, M.Ed. COLLEGE PLANNING AN OVERVIEW Presented by GVHS Counselors: Mr. Chip Harvey Ms. Anna Saracino. Keshala De Silva. Administrator Contacts Dr Vivienne Curtis – IAT Programme Coordinator Dr Stephani Hatch – Research Methods Course Director Sarah-Jane. Rev. A MonTueWedThuFri Weekly Pre-approval Weekly FS 0.9 Weekly Picnic Pgm rev Projects Approved Adv/IR Assigned.